The THERMO12 is a 12 channel k-type input amplifier and signal conditioner, the 12 channels of data are sampled at up to 20Hz and the resulting values are transmitted on CAN and/or RS232 output ports. 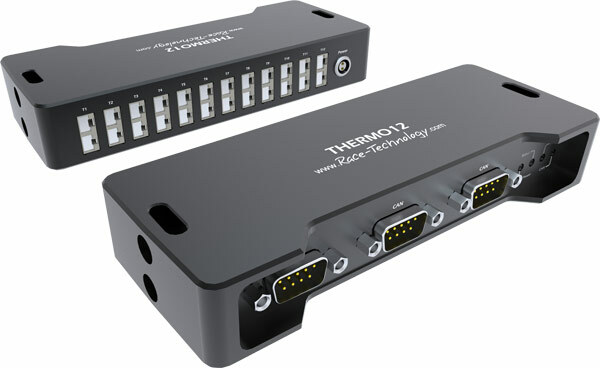 The THERMO12 can be connected directly with a Race Technology data logger such as the DL2, or a speed sensor such as the SPEEDBOX MINI). Additionally the THERMO12 can be used as a standalone thermocouple amplifier, trasmitting data to an external CAN or RS232 data logger. The data output rates and filtering are individually adjustable for each channel.